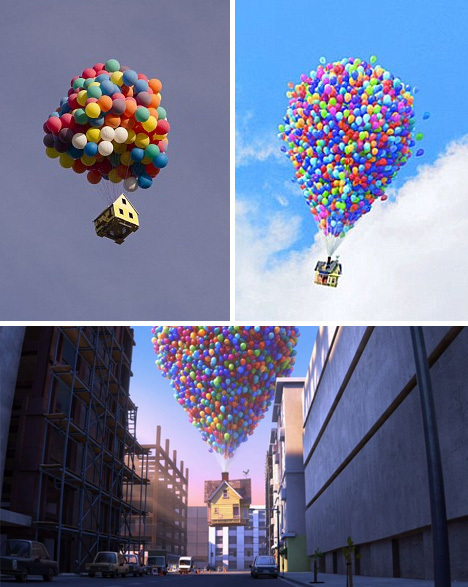 The fantastical film ‘Up’ features an old man, tired of being tethered to the ground, flying away using hundreds of helium-filled balloons. In real life, the world-record-setting cluster required to accomplish this was (amazingly) even smaller than the movie’s makers imagined. 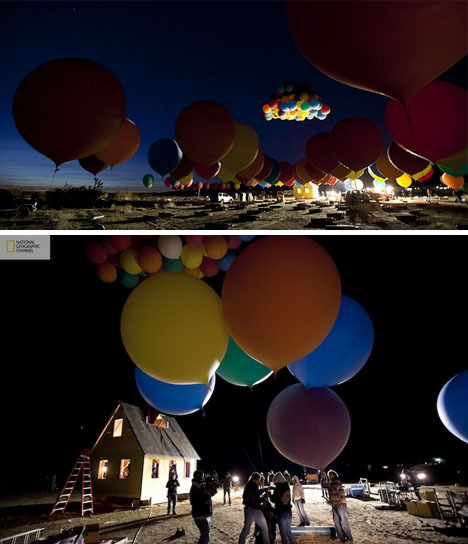 As part of a new National Geographic series titled “How Hard Can it Be?“, a real-life replica home was created in the flat deserts of California and released into the air – it went aloft eerily like the fictional version, and stayed up for over an hour. 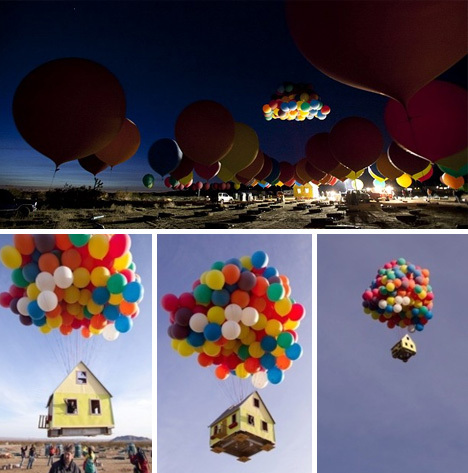 Each eight-foot-diameter balloon required one whole tank of helium to inflate, while a team of volunteers took days constructing the simple A-frame-house replica that would take the test flight. 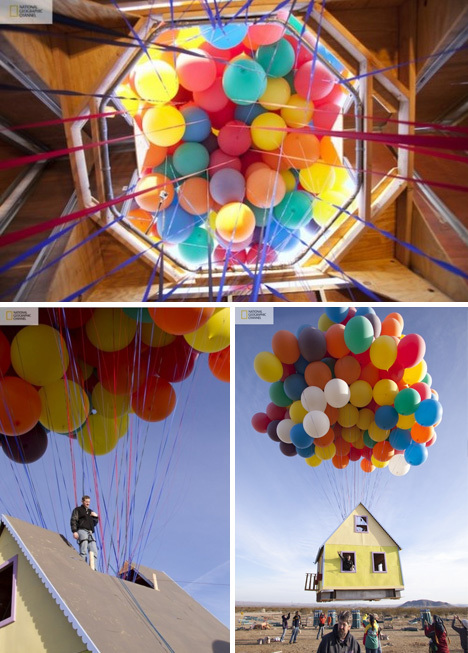 A team of hot air balloon pilots and engineers made sure it would work in theory, but no would could be certain how it would pan out in practice – the photos and videos, though, show an incredible success. 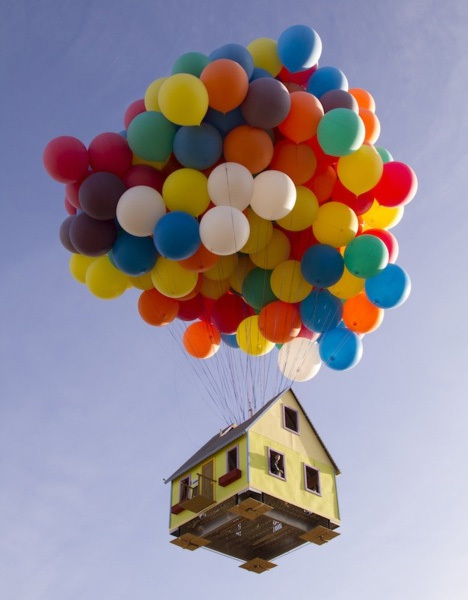 Unfortunately, there is still a bit of magic behind this trick – the structure sent skyward was full scale, but not a fully-loaded home packed with insulation, sheet rock and the rest of those pesky (heavy) finishing touches. There is, however, another real-world equivalent – the stodgy old Seattle ‘nail home’ whose occupant refused to leave their residence, no matter what, and fought being demolished to the bitter end.